AMSOIL Antifreeze & Coolant is newly formulated to provide benefits far beyond those found in today’s conventional antifreeze and coolant products. This revolutionary formulation provides maximum antifreeze and cooling protection in the most extreme temperatures and operating conditions. It can be used for seven years of 250,000 miles in passenger cars, light-duty trucks, vans and recreational vehicles. It lasts seven years or 750,000 miles in over-the-road diesel trucks. AMSOIL Antifreeze & Coolant is dyed neutral yellow and is compatible with all ethylene and propylene antifreeze and coolant formulations on the market, including DEX-Cool™®, Sierra™®, and Zerex™®. It is also compatible with fully formulated diesel antifreezes and other organic acid technology (OAT) and hybrid organic acid technology (HOAT) formulations. AMSOIL Antifreeze & Engine Coolant is formulated to provide benefits beyond those provided by today’s conventional antifreeze and coolant products. This revolutionary formulation provides maximum antifreeze and cooling protection in extreme temperatures and operating conditions. 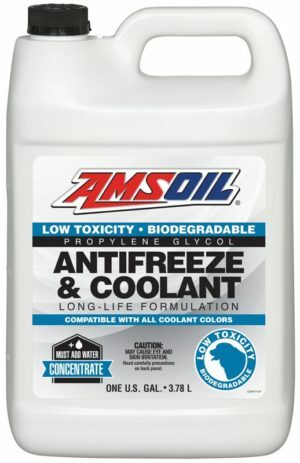 And unlike conventional ethylene glycol-based products, which are acutely toxic, AMSOIL Antifreeze & Engine Coolant is formulated with propylene glycol. It is biodegradable and its low toxicity limits the threat to children, pets and wildlife. AMSOIL Antifreeze & Engine Coolant contains a proprietary polyorganic acid technology. It eliminates the need for supplemental coolant additives and recharging cooling systems. AMSOIL Antifreeze & Engine Coolant provides extended service life in all gasoline and diesel vehicles. It can be used for seven years or 250,000 miles in passenger cars, light-duty trucks, vans and recreational vehicles. It lasts seven years or 750,000 miles in over-the-road diesel trucks. AMSOIL Antifreeze & Engine Coolant lasts longer than conventional products. It is also good for motorcycles, ATVs, snowmobiles and closed marine applications. AMSOIL Antifreeze & Engine Coolant is dyed neutral yellow and is compatible with all ethylene and propylene antifreeze and coolant formulations on the market, including DEX-COOL®, Sierra® and Zerex®. It is also compatible with fully formulated diesel antifreezes and other organic acid technology (OAT) and hybrid organic acid technology (HOAT) formulations. AMSOIL Antifreeze & Engine Coolant adheres to metal. It self-seals hairline cracks in welds and seams to help prevent leaks, without additional stop-leak products or fibrous materials. 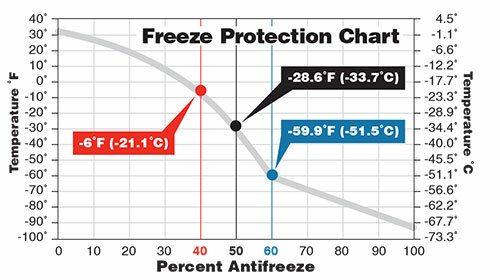 Independent tests reveal AMSOIL Antifreeze & Engine Coolant surpasses standards for metallic corrosion. It plates metal to protect, even when exposed to acids and salt spray. Standard allowances for loss in aluminum and solder are less than 60 mg. AMSOIL Antifreeze & Engine Coolant lost 0 mg in aluminum and less than 6 mg in solder. Standards for iron, steel, copper and brass allow a maximum loss of less than 20 mg. AMSOIL Antifreeze & Engine Coolant never exceeded a 3 mg loss in any of those metals in a testing period that was run for 10 weeks, three weeks longer than required.